SIALKOT: The situation was extremely tense in Daska tehsil of Sialkot district on Monday as protests by lawyers turned violent after a police SHO killed two lawyers including the president of the local bar association. Protests erupted in several cities following the killing of Rana Khalid Abbas, the president of the Daska bar association, and lawyer Irfan Chauhan in Daska earlier today. According to latest reports, charged demonstrators in Daska had set the office of the Deputy Superintendent (DSP) on fire. Lawyers in Lahore, Faisalabad, Gujranwala, and Multan also staged protests against the killing of their colleagues in Sialkot, with television footage showing some protestors resorting to attacks on police personnel and vehicles. Meanwhile, a large number of lawyers demonstrated outside the Punjab Assembly building in Lahore in protest against the killings. In Multan, furious lawyers broke the glass windows of a police mobile van as members of the People’s Lawyers Forum demonstrated at Kachehri Chowk. 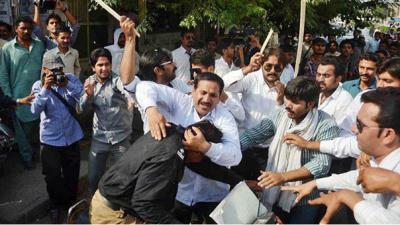 Similar scenes were witnessed in Faisalabad and Gujranwala as lawyers clashed with police personnel. The Punjab government has decided to launch a judicial investigation of the lawyers’ killing in Daska tehsil of Sialkot District. A letter will be written to the chief justice of Lahore High Court (LHC) in this regard. Meanwhile, TMO Daska has been suspended from his duties and directives have been issued to appoint Assistant Commissioner (AC) of the tehsil as an Officer on Special Duty (OSD). Inspector General Police (IGP) Punjab, Mushtaq Sukhera has vowed a transparent inquiry of the Daska incident saying that the probe would be launched in accordance with all legal and justice requirements. He also expressed grief over the loss of lives in the incident. Angry lawyers have set ablaze the office of Town Municipal Administration (TMA) as well as residence of the Assistant Commissioner (AC) in Daska tehsil of Sialkot District. The protests have spread to Gujranwala, Multan, Faisalabad and other cities and towns of Punjab province. Taking notice of the killing of two lawyers in Daska tehsil of Sialkot District, Prime Minister Nawaz Sharif has ordered a swift probe into the incident. He also has sought a report of the incident from the authorities concerned. “Nobody will be allowed to take the law into their own hands,” he said in statement issued in Islamabad. The Pakistan Bar Council (PBC), the main lawyers’ association, announced a nationwide strike on Tuesday, May 26. The PBC said that lawyers will hold protest rallies across the country tomorrow. The council also announced three days of mourning. A statement from the PBC vice-chairman condemned the murder of the two lawyers in Daska. The council demanded that the Punjab government immediately arrest the killers and take measures to ensure the protection of lawyers. Earlier, the Islamabad District Bar and High Court Bar associations also announced a boycott of court proceedings across the country tomorrow to register their protest. The Islamabad Bar Association has demanded immediate resignation from Chief Minister Punjab Shahbaz Sharif. The lawyers have also demanded neutral investigation into the incident. According to reports, the incident started when the Station House Officer (SHO) of the Daska city police station and members of the legal fraternity led by Daska bar association president Rana Khalid Abbas in Daska. The clash turned fatal when shots were allegedly fired by the police officer, which severely injured the bar association president and another lawyer Irfan Chauhan. Both injured lawyers succumbed to their wounds. DPO Asif Shahzad said things turned violent when police tried to stop the group of lawyers who were “rioting” in the tehsil’s Municipal Administration Office. He said that following a confrontation, the SHO fired the shots which severely injured three lawyers including the bar association president. Later, infuriated lawyers blocked traffic at Civil Chowk by burning tires and hurling stones at policemen. Law enforcers responded by firing teargas shells against the violent protestors. Shahzad said that the SHO who fired the shots has been taken into custody. Shortly after the incident, Pakistan Tehreek-e-Insaf (PTI) chairman Imran Khan posted messages on Twitter blaming the “Punjab’s Gullu police” of killing PTI lawyers including daska bar association president Rana Khalid Abbas. He said that two other PTI lawyers were also critically wounded in what he described as a “shocking and outrageous” incident. Nick Jonas, Priyanka Chopra to have a baby anytime soon?